The pancreas is one organ which does a dual work of producing hormones as well as helping in digestion, without making it’s presence felt. That is why many people are not even aware that there is such an organ….until it gets diseased enough to produce symptoms. Pancreatic cancer usually gives rise to vague and unrecognized signs or symptoms in the early stages, hence it is called a “silent cancer”. It is only later that the doctor and the patient realizethe possibilities of a cancer, when specific symptoms develop. The signs and symptoms depend on type of pancreatic cancer and the location of the tumor. 70% of cases complain of pain in the abdomen. It often starts with pain in the upper abdomen which radiates to the back. It can be worse after eating of after lying down. Sitting upright might relieve the pain. Initially pain can come and go, but later it gets constant. Pain can be due to nerves involved or due to the tumor blocking the stomach or upper part of intestine. 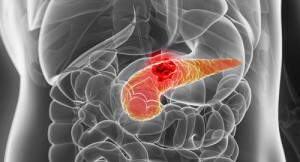 50% cases of pancreatic cancer suffer from jaundice. The most common signs are yellowness of skin and eyes. Other signs are dark urine, pale stools and itchy skin. Jaundice develops when there is increase in the bilirubin levels in blood. Bilirubin is a by-product of breakdown of red blood cells which is then removed from the body through the liver via bile fluid that empties into small intestines via a passage or a duct. When this duct is blocked (in this case by pancreatic tumor), bilirubin keeps building up in the body causing yellowness. Abnormal weight loss for no particular reason can be a sign that something is wrong. Pancreatic cancer can affect the action of the digestive juices that help in digesting food, especially fatty food. Hence, leading to weight loss. Bowel problems-a condition called steatorrhoea (large, pale, oily, smelly stools) can happen in pancreatic disease, due to weak digestion. Indigestion-Unexplained sudden onset of heartburn or indigestion, especially in older people could be an indication. Nausea and vomiting-Imbalance due to jaundice or indigestion can make people feel sick. Diabetes-Diabetes can occur if the pancreatic tumor interferes with the functioning of pancreas in producing insulin. Recent onset of diabetes in older people with no other history can be an indication. Fever-Inflamed tumor or blocked ducts can give high body temperature and shivering. Back pain-Upper abdomen pain spreading to upper back and is better by bending forward, must be examined for pancreatic conditions. unexplained acute infection of the pancreas. It is important to note that any of the symptoms mentioned here are common for a lot of illnesses and may not be a sign of pancreatic cancer only. Also, not every case of pancreatic cancer will have these symptoms. But if these symptoms persist and are unexplained, consult your physician for further evaluation. The intensity and the frequency of these signs and symptoms are important even if they are not related. If you feel that you are experiencing any of the above symptoms and would like to consult one of Dr Rajesh Shah’s associate doctors, do not hesitate in giving us a call at +91-22-66888888 or dropping in an email at info@lifeforce.in. Our associate doctors will also help define the scope of homeopathy and inform you about Dr Rajesh Shah’s research based medicines for cancer.